Black Lacquer High Top Cabinet. Accepts all bills with easy pay thermal ticket printer. Includes 400 tickets, locks and jackpot reset key. Lots of multipliers. Back lit reels. 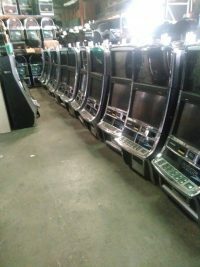 Real clean plug and play slot machine. Shipping specials with $200 off any second machine purchase. Call to order and or questins.